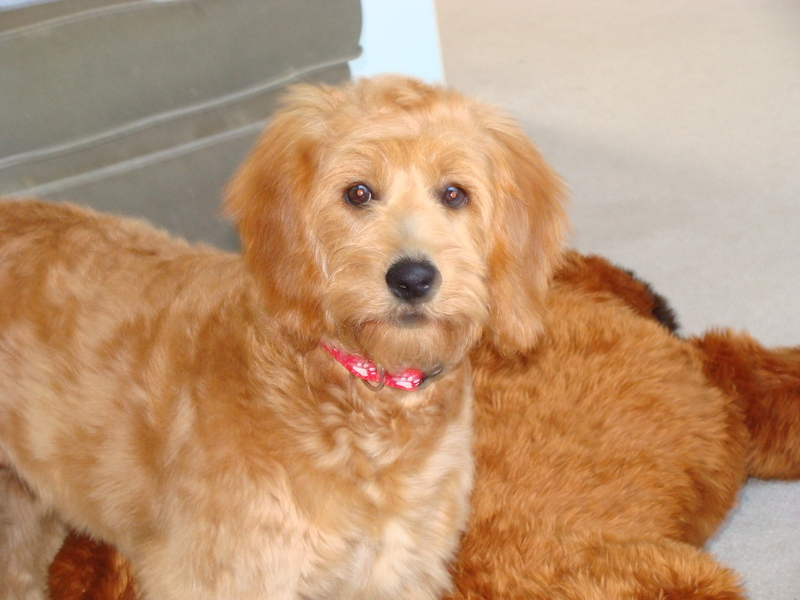 To follow is a collection of feedback we’ve gotten from all the loving owners of our Country Mini Goldendoodle puppies. Everyone I talk to that wants one – I have been sending them all your way!!! I have your phone number in my cell phone because everybody wants to know where I got him. He is really such a great dog – and smart too! He has already learned sit, come, stay (for treats of course) and he doing faboulsly on the potty training – we don’t have accidents unless we don’t realize he is at the door (he doest bark – not at anyone!!!) He is also sleeping thru the night now – waking us up with licks to go potty. I have never had a better, socialized puppy before. Thank you!!!!!!!!!!!!!!!! I don’t want to fill up your pages with GM pictures… lol…but I love to take them. Just let me know if you are getting too many..
Riley has been an exceptional puppy. We are absolutely thrilled with him. We have recommended your web site to several people we feel are genuinely interested in getting a puppy and would really appreciate an exceptional dog. Just sending you some pictures of Abby. She is doing great. It took some time for my other dogs to warm up to her but now they have learned to love her. We all love her!!! WE LOVE HER!!! Sorry it has been a while. I know I can leave her upstairs in her crate and come down to the computer once in a while, but I can’t seem to stay away from her very long. Everyone melts when they see her! Our wild Friday night consisted of a Petsmart adventure to see if we could buy MORE toys for her. She gained a pound in a week between your vet visit and ours. We’re feeding her a ½ cup at every meal so I don’t think it’s like she’s pudging out, she’s just growing! It’s amazing to see her learn her name and figure things out. She was barking as she went down each step at first, now she’s deciding when she wants to go up and down on her own. She stays by us almost all of the time and actually likes children better than new neighbor dogs. Brian is so very tender with her it amazes me. He changed our bedspread so she could cuddle by us in the morning, he had stated prior to bringing her home that animals don’t belong on furniture, I love how the rules bend!!! More cuddle time for me!!! He had his first day at his new job today and I think he missed her. The only thing he complains about is her “puppy breath”, but he still can’t stop cuddling her. I feel so enriched having her, I can’t imagine how having children will make me feel. 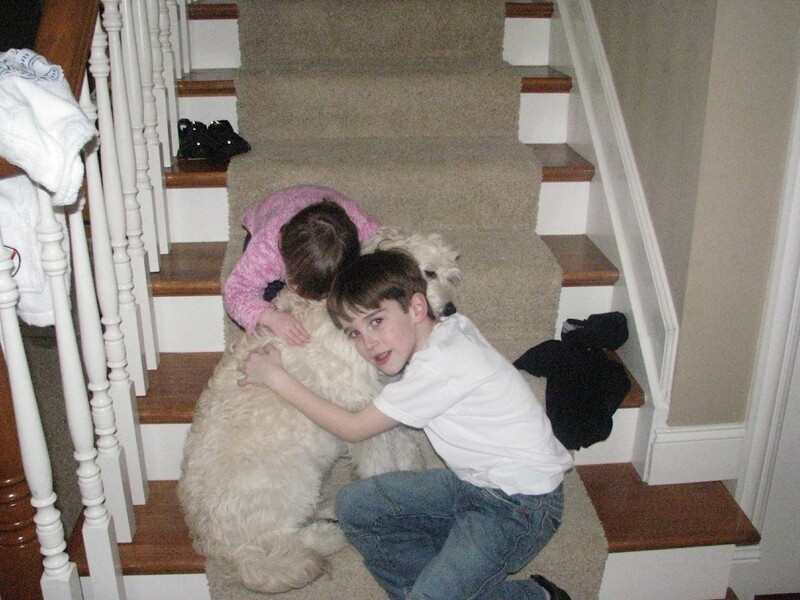 I think the picture of you and Kona should go on the website! You are a beautiful woman fulfilling your life mission let it shine! You have been a wonderful person to connect with and I honestly believe that you and Kona have been my angels to help me pull out of my depression type funk. You and her have guaranteed laughter and smiles and I plan on passing it on. PS: I’ve just started reading “From Baghdad with Love”, it is about a puppy that the marines found in Fallujah and adopted. Have you read it/ heard of it? I’m hooked on it!! !